etc…whatever you can do with a keyboard, a BadUSB can do also. Of course, you could buy a Rubber Ducky from Hak5 , but you’d miss all the fun tinkering with cool things. This guide is made for Digispark from Digistump. Digispark can be programmed so that when the computer accepts it as a keyboard, it starts to send key presses to computer. Since Digispark has only 8Kb (6Kb of programmable space after bootloader), options are somewhat limited, but should be more than enough for most purposes and it’s also possible to circumvent the space limit. Since the installation guide is excellent in the digistump.com site, I will not even try to recreate them in detail here. Configure Arduino-IDE by these instructions. And select “Digispark (Default – 16.5mhz)” as a board. Arduino-IDE should now be good to go. Generation of the payload is pretty straightforward. It’s generated with “msfvenom” as follows. Of course, LPORT and the LHOST should be changed to match your IP-addresses. LHOST should be the Kali box where the metasploit handler is waiting for the connection back from the victim and LPORT is the port you want to use. The output of the msfvenom is directed to file called ‘mShell_880‘. The output of the executable payload is only 155 bytes, so we have plenty of space left. Since the payload is “typed” to victim, it has to be Base64 encoded, so we can “input” it to victim and generate the executable payload. Basically, what we want to do, is to echo the Base64 string and decode it and direct the output to a file, change the executable bit for the file and run the payload. “mShell_880.b64” – file now holds our payload encoded in Base64. We can use this string in our program that outputs it to victims terminal. * Works with US - keyboard layout only, because of testing purposes. * 4. Change executable bit for the payload and execute it. Now, it’s possible to check the code for errors from Arduino-IDE by clicking “Sketch => Verify/Compile” (or by pressing CTRL + R on the Arduino-IDE). If no errors found, the program is ready to be uploaded to Digispark by first clicking “Sketch => Upload” (or by pressing CTRL + U on the Arduino IDE) and you should get a following info on the bottom of the IDE window. Now the Digispark can be inserted to a USB port on the computer. After a while, the update should go through and you should see following info. 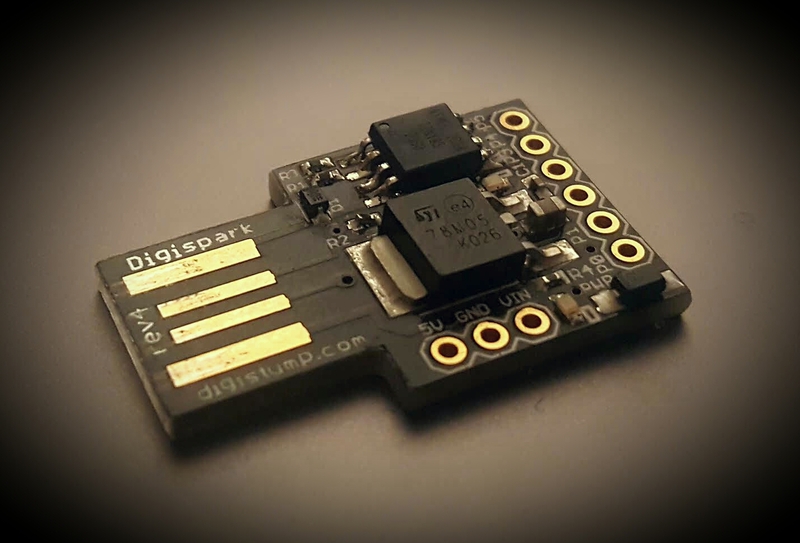 The programming of the Digispark is now ready and it now is a ‘BadUSB’. Note: I had some problems with the uploading. Sometimes it takes a few tries to get a succesful program upload to Digispark, don’t yet know why.. The whole point of this is guide is to demonstrate how dangerous it is to plug in USB sticks. Keep in mind that normal USB stick firmwares can also be reprogrammed like this and it doesn’t necessary help that they are formatted. Now we are ready to test the BadUSB we have just created. When the Digispark / BadUSB is now inserted to linux computer, it should open the dashboard/search, open terminal, echo the Base64 encoded payload and decode it to file, change the executable bit for the payload file and run it. When the payload is run, multi/handler gets the shell. Here is a video recorded when the Digispark / BadUSB is inserted in to the linux computer. 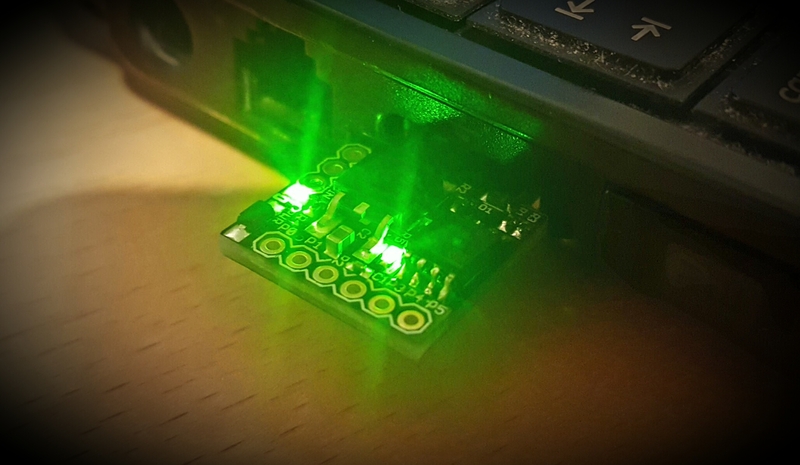 In the image above, you can see both LEDs from the Digispark are lighted, when the payload on the Digispark is executed. As for mitigation, for Windows, there is a program called ‘Beamgun‘ (haven’t tested it yet). Of course as for Windows, Linux, OSX you could always disable USB ports, create scripts that prevent adding new hardware etc., but if you really need USB devices, that would be pretty cumbersome in the long run. And of course…don’t plug untrusted devices to your computer and don’t let anybody plug unknown USB devices to your computer. There is also a physical, small box called ‘USBguard‘ (also not tested in this experiment), that should block these kinds of attacks. BadUSB stick could also be created with a normal USB drive (e.g. ‘Rubber ducky’ from Hak5) and this shows how bad effects plugging ‘found’ USB stick can have. Payload could also be something more nasty, e.g. wipe the whole drive from the computer. I’ll post example codes for Windows and OSX also when I have time to tinker some more.